If you have teenage girls then you MUST buy them this copy of TEEN Breathe. 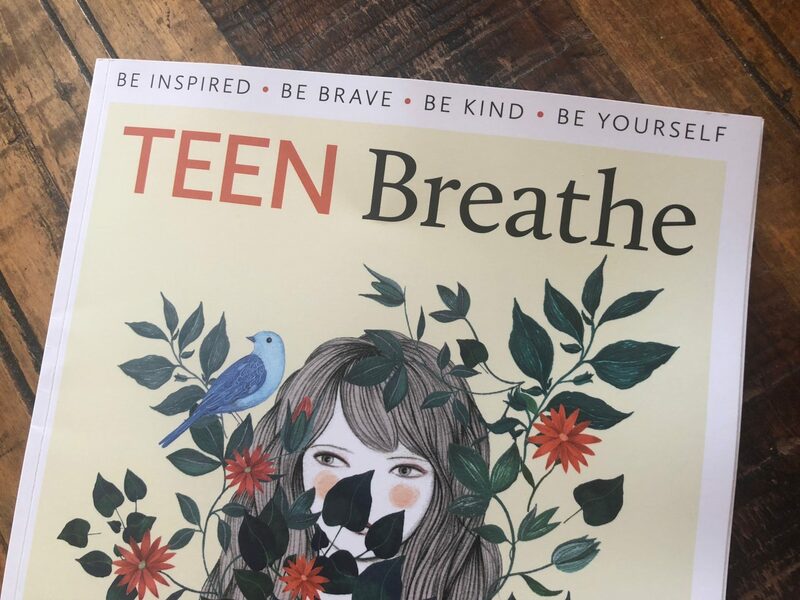 TEEN Breathe is the magazine that I wish that I had had when I was growing up; and (don’t tell anyone), I actually love reading it as an adult too! The magazine is bursting with interesting and insightful articles which aim to inspire for a happier, healthier an more fulfilled life. 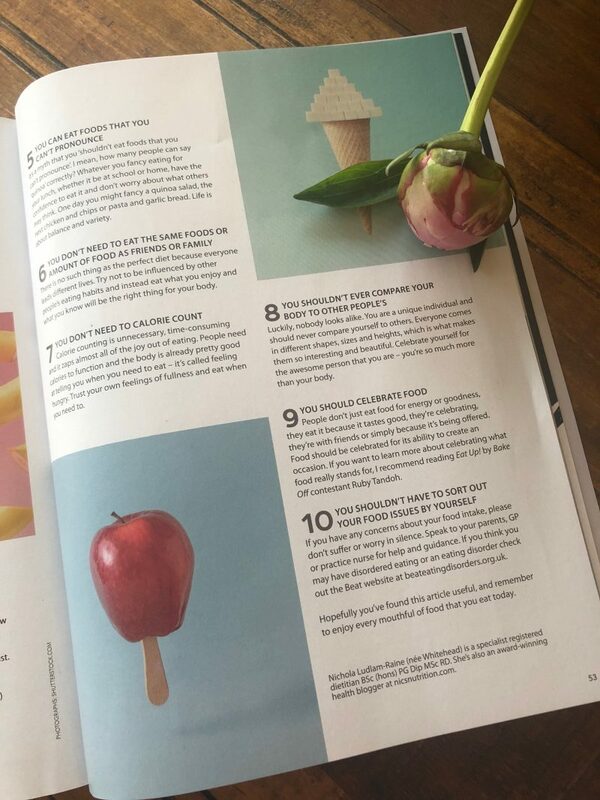 I feel honoured to be the contributing dietitian to this magazine and this month I have written all about the 10 food TRUTHS that I think girls should know. I’ve popped my article below just to give you an insight into the magazine but please do let me know if you pick up or order a copy!! “Advice and information on food and nutrition is everywhere; from the T.V. to social media and magazines, it can often seem impossible to get away from! Even more frustrating though is the matter of who to trust when it comes to nutrition information; there is so much in the way of conflicting advice that it can be confusing when working out what to believe and act on. 1) There’s NO such a thing as ‘healthy’ and ‘unhealthy’ foods. Every single food can feature in a healthy balanced diet, and that includes foods traditionally referred to as ‘unhealthy’, for example chocolate, cookies, cakes and sweets. This is because all foods, irrespective of their nutrient content, contain some sort of goodness; whether it’s energy for work and play or simply an amazing taste to nourish your soul at a birthday party, family event or simply chilling in front of the T.V.! It’s important to not cut out or be fearful of eating any foods not only for your health but for a positive relationship with food and social life too. For example when I think of a Friday night in with my girl friends the first thing that springs to mind is pizza and ice-cream! To make it balanced I’ll add a side salad and the next day I’ll serve some fruit with our morning porridge! 2) Sugar ISN’T bad for us. Although it’s a good idea to cut down on sugary fizzy drinks (which aren’t good for teeth health), a little bit of sugar is A-OK. Whatever your preferred sweet food is enjoy it, without the guilt, in moderation; and this can even be daily in addition to relatively healthy meals! I love sitting down on an evening with my sister chatting with a cup of builders tea and some chocolate digestives; food is so much more than calories and macros, it’s about the memories that it helps to create. 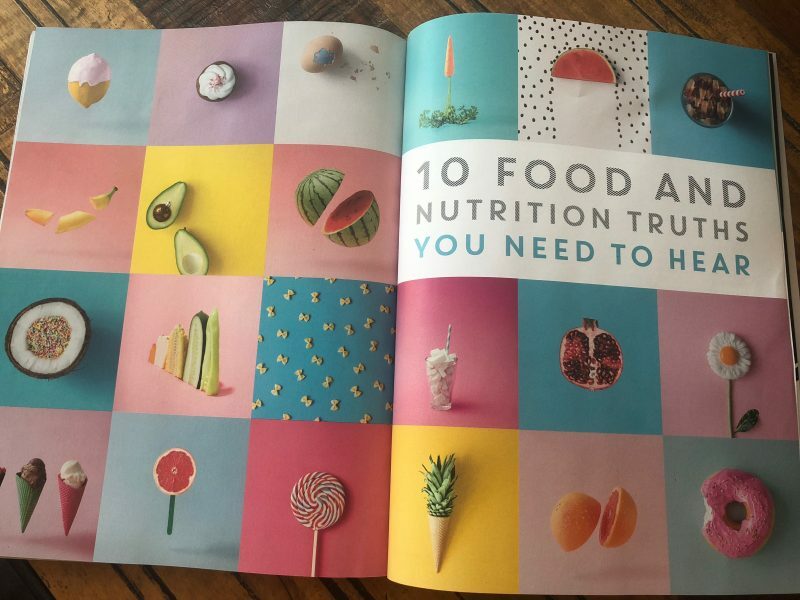 3) Everything you read about food in health magazines ISN’T true. 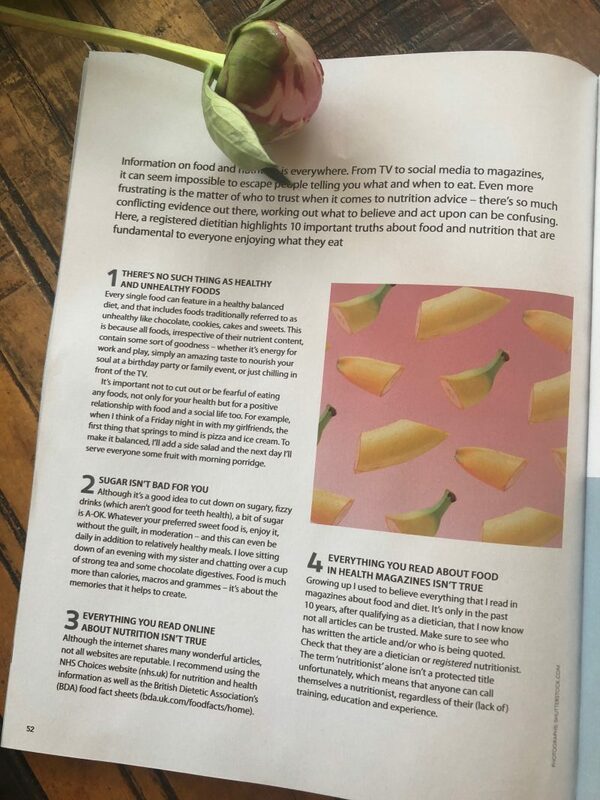 Growing up I used to believe everything that I read in magazines about food and diet; and it’s only in the last 10 years, after qualifying as a dietitian, that I now know that not all articles can be trusted. Make sure to see who has written the article and/or who is being quoted; check that they are a dietitian or registered nutritionist. The term ‘nutritionist’ alone isn’t a protected title unfortunately, which means that anyone can call themselves a nutritionist, regardless of their (lack of) training, education and experience. 4) Everything you read on online about nutrition ISN’T true. Although the internet shares many wonderful articles to read not all websites are reputable. I recommend using the NHS Choices website for your nutrition and health information, as well as the British Dietetic Associations Food Fact Sheets. 5) You CAN eat foods that you can’t pronounce. It’s a myth that you ‘shouldn’t eat foods that you can’t pronounce’; I mean how many of us can say Quinoa correctly?! Whatever you fancy eating for your lunch whether it be at school or home have the confidence to eat it and don’t worry about what others may think; one day you may fancy a quinoa salad, and the next you may fancy chicken and chips. Life is about balance and variety. 6) You DON’T need to eat like your friends or other people. There is no such thing as the perfect diet as we all lead such different lives. For example if you are active or do more sport than others then you’ll need to eat more carbohydrates to perform at your best and if you have a nut allergy then you should avoid eating peanut butter! Try not to be influenced by other people’s eating habits and instead eat what you enjoy and what you know will be the right for your body. 7) You SHOULDN’T have to sort out your food issues by yourself. If you have any concerns about your food intake do not suffer or worry in silence. Speak to your parents, GP or practice nurse for help and guidance. If you think you may have disordered eating or an eating disorder check out the Beat website. 8) You DON’T need to calorie count. Calorie counting is not only unnecessary and time-consuming but it can zap almost all of the joy out of eating. We NEED calories to function and our body is already pretty good at telling us when we need to eat; it’s called feeling hungry! Trust your own feelings of fullness and eat when you need to. 9) You SHOULDN’T compare your body to others. Luckily, nobody looks alike; we are unique individuals and should never compare our selves to others. We each come in different shapes, sizes and heights, which is what makes us so interesting and beautiful! Celebrate yourself for the awesome person that you are – you’re so much more than your body! 10) You SHOULD celebrate food. We don’t just eat food for energy or goodness, we eat it because it tastes good, we’re celebrating, we’re with friends or it’s simply been offered to us! Food should be celebrated for it’s ability to create an occasion and if you want to read more about celebrating what food really stands for, I highly recommend reading the book ‘Eat Up!’ by Ruby Tandoh. I really hope that you find this article useful and remember to enjoy every mouthful food that you eat today! *This article was originally written for TEEN Breathe. Next Post The HiLo Protein Bar – My Review!